While South Korea today is a vibrant democracy, this was not always the case. From the 1950s, a series of US-backed military dictators led the country. These military regimes frequently violated human rights under the banner of protecting national security. South Korea’s dictatorial regimes lasted until a series of uprising and protests forced the administration to hold free elections—culminating in the June Democracy Movement or the June Struggle of 1987. 1987: When The Day Comes tells the story of the June Struggle, starting from the killing of a student protestor by overzealous police officers. Ha Jung-woo (The Handmaiden, The Tunnel) stars as local prosecutor Choi Hwan, alongside Kim Tae-ri (The Handmaiden) as Yeon-hee, a correctional officer’s niece. In the film’s opening minutes, police officers interrupt Prosecutor Choi’s humble noodle dinner, demanding that he issue an order for immediate cremation of the murdered student’s body to prevent an autopsy. Choi’s annoyance builds from him being kept away from his bowl of noodles, to anger at the lack of respect for the law that the police officers exhibit. He ultimately orders an immediate autopsy, defying the authoritarian regime. A fast-paced cat-and-mouse game ensues, with government forces attempting to suppress media coverage after Prosecutor Choi leaks the true cause of death to a journalist friend. The confrontations eventually get physical as the police try to bar the family from observing the autopsy at the hospital. Ultimately, two police officers are sent to jail as scapegoats, and the story turns to the actions of a corrections officer sympathetic to the cause of the dead protester—Han Byung-yong (Yoo Hae-jin of The Flu and Confidential Assignment)—and his niece, Yeon-hee. In fact, the killing of the student protestor has its roots in historical events: Park Jong Chul was the real-world victim of water torture while being interrogated by secret police. Though authorities initially suppressed Park’s cause of death, an autopsy later revealed bruises—evidence of torture. However, in 1987, the death of Park itself takes a backseat to the heroic actions of numerous individuals involved in bringing the true nature of his death to light. 1987 focuses on the prosecutor who refused to bow to government pressure, the doctors who performed the autopsy, and the journalists who dared to report a story that the government actively suppressed. Weaved throughout the 2-hour-long film are reminders that the actions of these “little people”—low-ranking government officials and young students—can ultimately help change the world for the better. Yeon-hee, a student who initially is afraid of confronting authority, inadvertently gets caught up in a protest on her way home, where police club and gas protesters. Yeon-hee meets and falls in love with a dashing fellow student and protester as they attempt to escape. When her new friend is severely injured in a protest, Yeon-hee becomes angry with the government’s actions and joins a protest herself after she finds out that he later died from his injuries. Yeon-hee’s new friend is actually based on Lee Han-yol, a student protester who was injured by a tear gas canister and ultimately died from his injuries. Days before his untimely death, the chosen successor of the reigning Korean autocrat—Roh Tae-woo—issued a declaration promising to implement democratic reforms including direct Presidential elections, the release of political prisoners, and restoration of the freedom of the press. Roh Tae-woo ultimately went on to win the Presidential elections later that year as democracy advocates split their vote. 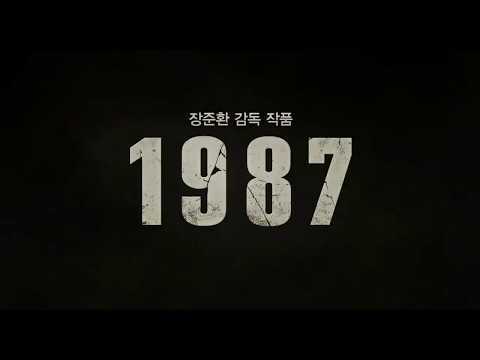 What was particularly special about 1987 is that it shys away from the bullet points that historians have recorded in favor of the unremembered individuals whose actions contributed to free elections in South Korea later that year. While martyrs made unthinkable sacrifices in the fight for democracy in South Korea, 1987 is a somber reminder that all of us have a role to play in fighting for, and defending democracy. With democratic ideals increasingly under threat around the world—whether through questionable digital surveillance tactics, increased police brutality against minorities, or increasingly tight government regulation—we could all do with a reminder that freedom isn’t free. 1987: When The Day Comes – Korea. Directed by Jang Joon-hwan. First released December 2017. Running time 129 min. Starring Kim Yoon-seok, Ha Jung-woo, Yoo Hae-jin, Kim Tae-ri, Park Hee-soon, and Lee Hee-joon.